FTP is a protocol that allows you to easily upload, download, and modify permissions of files for your web site. In fact, it’s the recommended method of managing files on your account offering better flexibility than File Manager within the control panel. FTP follows the same login as e-mail and terminal services on your account. Your login is of the form: username@domain. Note: some FTP clients misinterpret @ in the login as a hostname delimiter, common when accessing FTP as a single command, in such circumstances replace @ with #: username#domain. FTP supports normal, unencrypted communication in addition to Auth TLS (sometimes called “explicit encryption“). Both use the normal FTP port, 21. SFTP requires terminal access and wraps FTP around a secure terminal session. SCP works similar to SFTP, but only transfers files and nothing more. Note: just now switching hosting providers to Apis Networks? Use the server name instead of your domain name to access FTP before changing DNS. 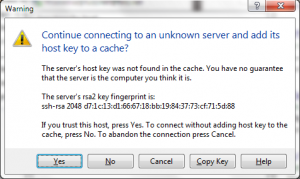 Example application connecting to FTP using WinSCP + encrypted communication. Example quick connect settings in FileZilla. No encrypted communication available. 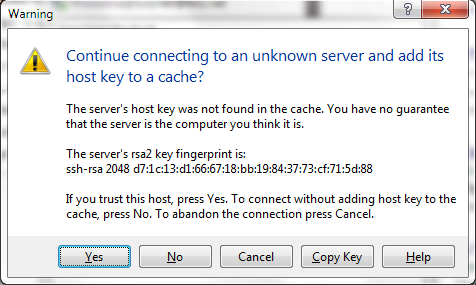 Upon first connection, the FTP client is presented with a warning concerning the host key (or server key). This is a normal side-effect of using self-signed certificates on the servers. Click Yes/Proceed to continue connecting to the FTP server. A notice first presented by a self-signed certificate installed on the FTP server in WinSCP. Note: FileZilla was removed from our list of recommended Windows clients for protocol problems reported by our users with older versions. This has since been resolved, but now its installer program is stuffed with opt-out adware from Sourceforge, its content-distribution partner. It is available as an option, but not recommended for third-party reasons. This entry was posted in FTP and tagged ftp, logging in.